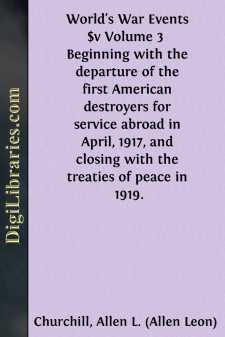 World's War Events $v Volume 3 Beginning with the departure of the first American destroyers for service abroad in April, 1917, and closing with the treaties of peace in 1919. A DESTROYER IN ACTIVE SERVICE BY AN AMERICAN OFFICER April 7. War accepted with equanimity. Life on a destroyer is simple. Well, I must confess that, even after war has been declared, the skies haven't fallen and oysters taste just the same. I never would have dreamed that so big a step would be accepted with so much equanimity. It is due to two causes, I think. First, because we have trembled on the verge so long and sort of dabbled our toes in the water, that our minds have grown gradually accustomed to what under other circumstances would be a violent shock. Second, because the individual units of the Navy are so well prepared that there is little to do. We made a few minor changes in the routine and slipped the war-heads on to the torpedoes, and presto, we were ready for war. One beauty of a destroyer is that, life on board being reduced to its simplest terms anyhow, there is little to change. We may be ordered to "strip," that is, go to our Navy yard and land all combustibles, paints, oils, surplus woodwork, etc. ; but we have not done so yet. We were holding drill yesterday when the signal was made from the flagship, "War is declared." I translated it to my crew, who received the news with much gayety but hardly a trace of excitement. April 13. Anxiety to get into the big game. There is absolutely no news. We are standing by for what may betide, with not the faintest idea of what it may be. Of course, we are drilling all the time, and perfecting our readiness for action in every way, but there is a total absence of that excitement and sense of something impending that one usually associates with the beginning of war. Indeed, I think that the only real anxiety is lest we may not get into the big game at all. I do not think any of us are bloodthirsty or desirous of either glory or advancement, but we have the wish to justify our existence. With me it takes this form—by being in the service I have sacrificed my chance to make good as husband, father, citizen, son, in fact, in every human relationship, in order to be, as I trust, one of the Nation's high-grade fighting instruments. Now, if fate never uses me for the purpose to which I have been fashioned, then much time, labor, and material have been wasted, and I had better have been made into a good clerk, farmer, or business man. The desire to be put to the test. I do so want to be put to the test and not found wanting. Of course, I know that the higher courage is to do your duty from day to day no matter in how small a line, but all of us conceal a sneaking desire to attempt the higher hurdles and sail over grandly. You need not be proud of me, for there is no intrinsic virtue in being in the Navy when war is declared; but I hope fate will give me the chance to make you proud. April 21. A chance to command. Bringing a ship to dock.